It is 4AM as I write this post. I have been up for an hour and a half. I hate it when I can’t sleep. There's a nap later in my day I bet. The first boil with the peppers. What would a sane person do in the same circumstance? Maybe have a cup of cocoa and try to go back to sleep? Not me. I do the unexpected. 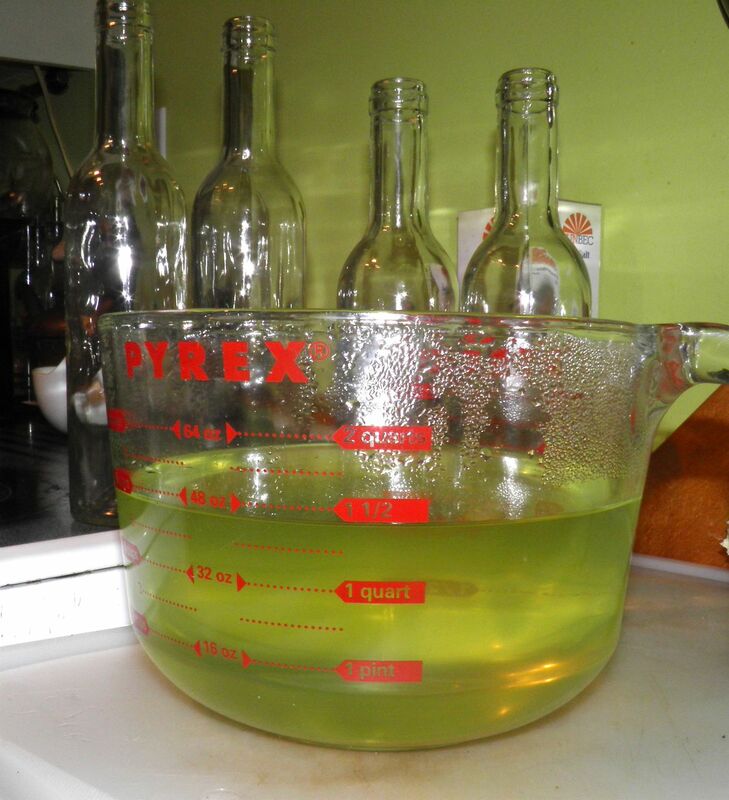 I make liqueur. It’s a bit of an oddity, this one: jalapeno lime liqueur. 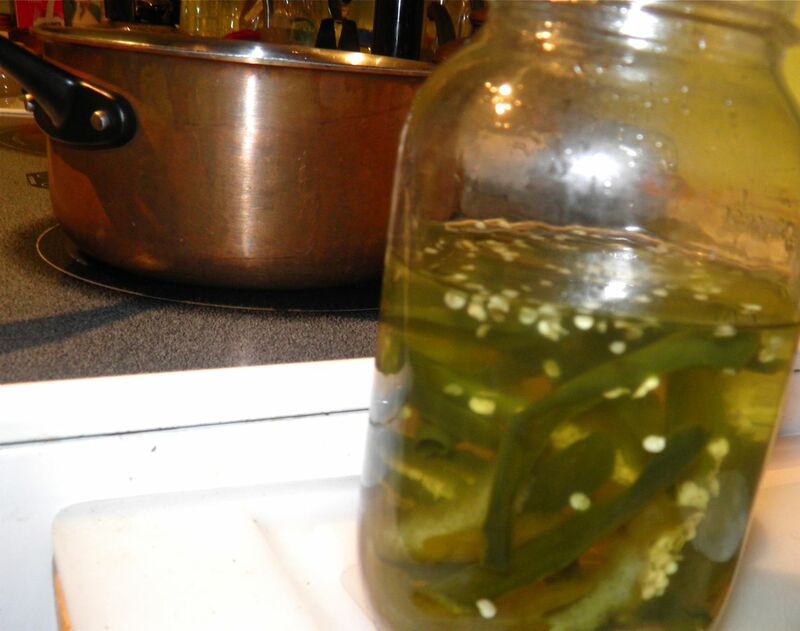 Jalapeno liqueur may sound a bit unusual, but it’s not unheard of. Can you imagine the unexpected boost it would provide to Christmas or New Years cocktails or martinis? After infusing for one week. If you start making this liqueur in the next day or two you can have it ready for December 31. Just think of the fun you can have! I was going to post a drink recipe that uses this green devil, but instead I think I’ll post a link. If you click HERE you’ll open a window to barnonedrinks.com that lists 11 different alcoholic drinks that use jalapeno pepper. I would suggest that you could simply do a substitute. Where it lists jalapeno, use 1/2 or 1 ounce of this jalapeno liqueur. There’s some interesting names: Cajun Martini, Life in Hell shooter, and Sweet heat cocktail are only three. The last one in the list has an interesting name, too. You’ll have to go to see it. Hmm. Shooters. I never thought of that. I bet this liqueur would be very good in a shooter. Scarily good. So how hot is this? For the most part it’s up to you. 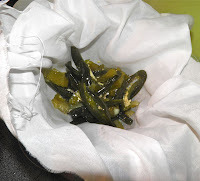 I’ve listed 4 to 6 jalapenos. The number of jalapenos depends on two factors: the size and how hot you want your final liqueur to be. I used four jalapenos, but they were on the large size. My end result has quite a tingle on the tongue. The drop of food colouring serves an important purpose. It tints the liqueur a delicate green, and it also serves as a visual warning that jalapenos were used in this liqueur’s creation. I hope the friends on my gift list appreciate spice! A beautiful light green, and evil. 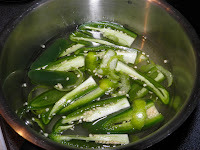 Wash the jalapenos well and pat dry. Trim off the stem ends and slice the remaining pepper. 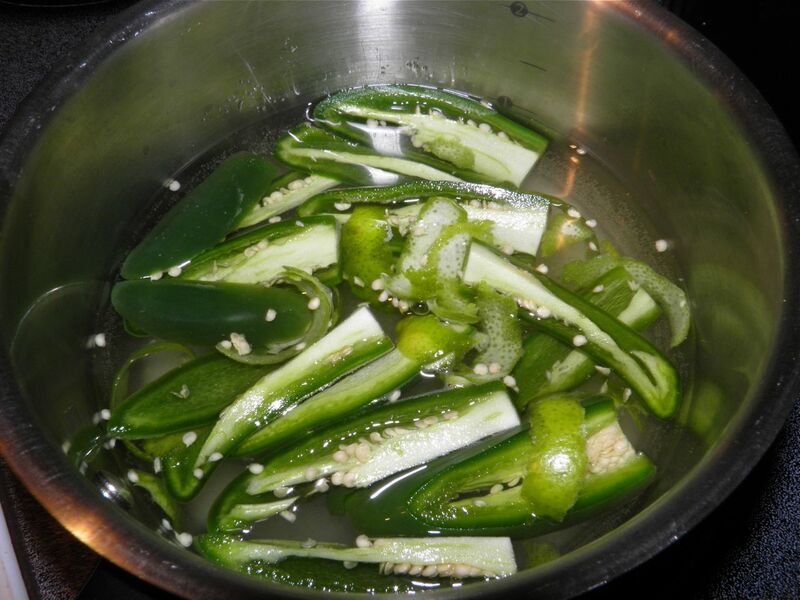 Combine 2 cups of the sugar, 2 cups of water, the sliced pepper and lime rind in a saucepan. Bring to a boil and let cook for 5 minutes. At the end of the time, place the mixture in a Mason jar (or other non-metal container with a tight fitting lid) and refrigerate for one week. A the end of the week place the mixture, including the peppers and rind, back in a saucepan. Add the final 1/2 cup of sugar and water. Bring to a boil again and cook for 5 more minutes. Strain the mixture through a cloth-lined sieve. Let cool slightly. Then combine with the vodka and bottle. Label the bottles clearly. This is quite spicy! 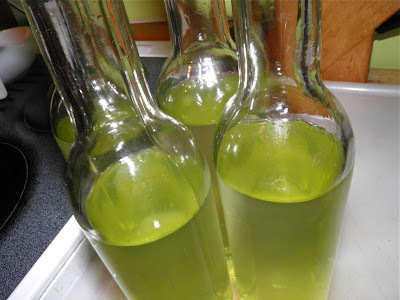 How long will this liqueur keep and does the final product need to be refrigeratd? Also, can I use red jalapenos? I still have red and green ones on my plant. Hi. It doesn't need to be refrigerated and you can use red or green jalapeños. The end result will depend on the spiciness of your peppers. You want some heat in the finished liqueur. I expect the liqueur will keep for at least 6 months, out of direct sun, and probably longer.